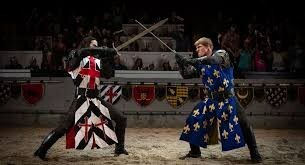 Experience Medieval Times an unforgettable dinner theater in Lyndhurst, New Jersey. 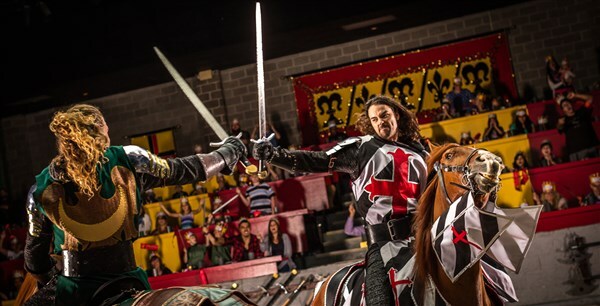 Horses, knights, swordplay & jousting tournament in a huge arena - which champions will win? Travel through the mists of time to a forgotten age and a tale of devotion, courage and love  at Medieval Times Dinner & Tournament. Imagine the pageantry and excitement that would have been yours as a guest of the royal court ten centuries ago. Thats exactly what you will experience at North Americas most popular dinner attraction. The year is 1093 A.D.and you are the guests of the royal family. The Lord of the castle has invited over 1,000 friends, neighbors and foes to a Royal Tournament. Every detail has been faithfully recreated for your entertainment and delight. Imagine stepping back in time one thousand years as you feast on a hearty four course banquet served Medieval Style. You'll marvel as spirited stallions perform intricate maneuvers. 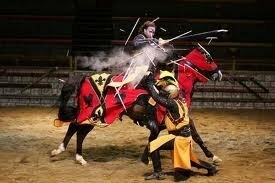 Gaze in awe as fearless Knights on horseback compete in daring tournament games of skill and accuracy. And when challenges are issued on the field of valor, you'll cheer your Knight to victory as he battles for the right to choose his Queen of love and beauty. Perhaps it will be you! Medieval Times’ noble guests feast on garlic bread, tomato bisque soup, roasted chicken, sweet buttered corn, herb-basted potatoes, the pastry of the Castle, coffee and two rounds of select beverages.